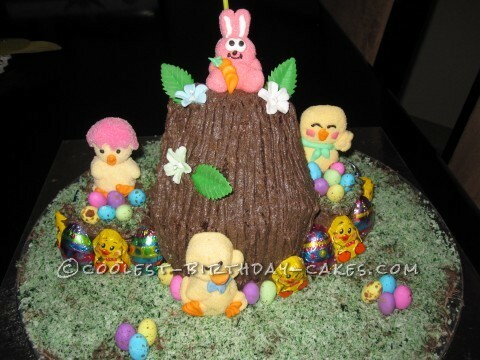 A simple chocolate cake with butter cream icing, I tried to shape it like a tree trunk and I used shop bought Easter bunnies, chickens and Easter eggs for the decorations. There is also fondant leaves and flowers and the base is butter cream with green food coloring used to color the shredded coconut. My son’s friends and teachers were wowed by the cake even though it do not take much baking but more thought about the lay out of the cake. My suggestion for anyone who is going to try this cake, use a firmer cake as a very crumbly chocolate cake as I enjoy a good textured cake rather than one that looks good on the outside but does not taste good on the inside. It’s a bit difficult when you trying to shape a tree and the crumbs start falling every where. However the kids loved it and that was most important at the end of the day!